This is it—the final phase of your work. Because you're going to flatten the painting image as part of the process, you'll create a duplicate of the original as a safeguard, in case you ever need to go back and edit it. You'll add one last touch to give the textured picture frame a dimensional appearance. 1 Click the image window for your umbrella painting to make it active. 2 Choose Image > Duplicate to create a duplicate image file, and name the duplicate Autumn_flat.psd. Click OK.
3 In the Layers palette menu, choose Flatten Image to combine all the layers in the Autumn_flat file. 4 In the toolbox, select the move tool (v.). 5 Hold down Shift and drag the painting from the Autumn_flat.psd image window into the Matte.jpg image window. 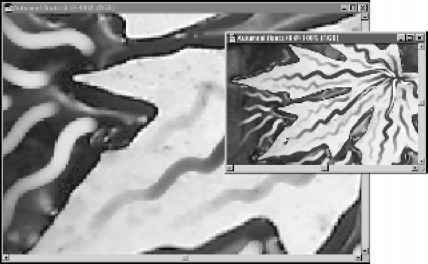 The flattened painting appears as Layer 1 in the Matte.jpg Layers palette. Holding down the Shift key as you drag in the painting image automatically centers it in the Matte.jpg image, so that the textured picture frame is equally sized around the painting. 6 With Layer 1 selected in the Layers palette, click the Add A Layer Style button (<«) at the bottom of the palette to open the pop-up menu, and choose Inner Shadow. 7 In the Layer Style dialog box, set the Inner Shadow options, with the Opacity value at 85%, the Distance at 6, and the Size at 7. Leave the other settings unchanged, and click OK.
Congratulations, you've finished your painting. You can save your file or print it on a color printer as a souvenir. This lesson represents just the tip of the metaphorical iceberg in terms of the potential of the painting tools. 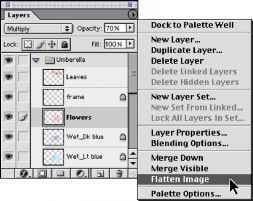 For more information, see the painting topics in Adobe Photoshop 7.0 online Help.